Griffin Technology, a leading manufacturer of accessories for home, mobile, and personal technology, has today announced the release of its “ultimate space-saving, countertop charging and storage solution” called the PowerDock 5. While the charging dock has been optimised for safely charging and storing up to five iPads, iPhones or iPods at the same time, other smartphones, tablets and USB devices can also be used with the PowerDock 5. It doesn’t take up much room, about the same as a single iPad! James Finney, Category Manager of Griffin’s power products said, “The PowerDock 5 is ideal for households and work environments that use multiple iOS devices”. “It keeps users’ device cables tucked away and organized, ready for use at any time”, he added. 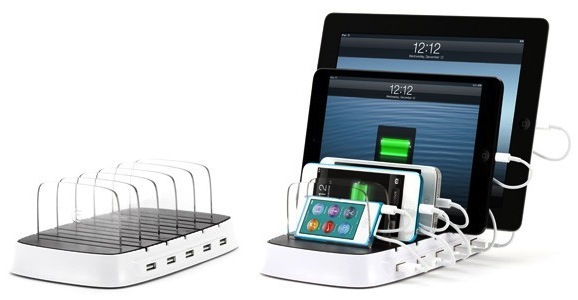 Griffin PowerDock 5 is now available online for $99.99.